Seoul, South Korea (May 23, 2017) – CJ 4DPLEX, the world’s leading 4D cinema company, revealed today that the international blockbuster “The Fate of the Furious” isthe most watched 4DX film of 2017, and is expected to soon surpass the 1.5 million attendance mark. The box office success was driven by the best opening week performance in 4DX history, reaching 760,000 moviegoers – 31% more than the first week attendance for 2015’s “Star Wars: The Force Awakens” (580,000) in 2015. In overall worldwide success, “The Fate of the Furious” had the biggest global opening of all time with $542 million in global box office performance. 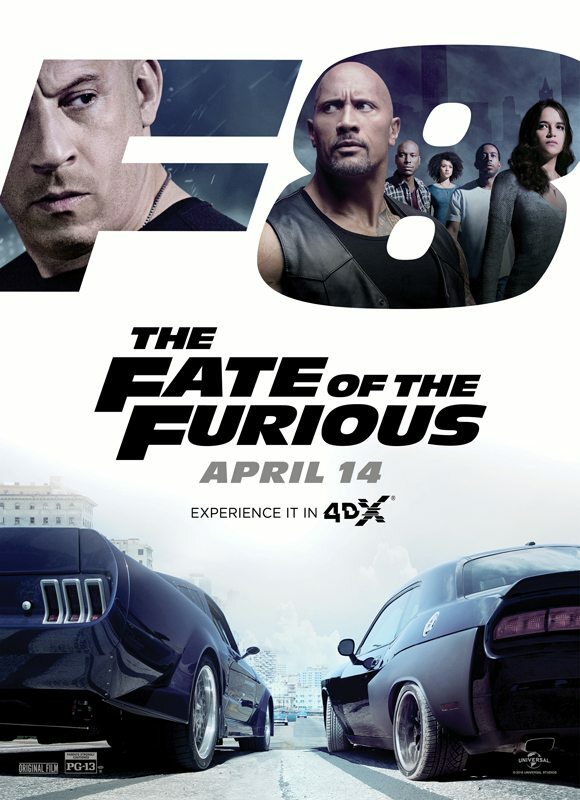 As a result, “The Fate of the Furious” today ranks as the third most watched 4DX film of all time, trailing close behind “Star Wars: The Force Awakens” and “Jurassic World.” The film, starring Vin Diesel, Dwayne Johnson, Jason Statham, Michelle Rodriguez, Tyrese Gibson, Kurt Russell, and Charlize Theron, and directed by F. Gary Gray, is currently continuing its run in 4DX theatres around the world. “The Fate of the Furious” in 4DX was highly-anticipated, following the success of “Furious 7” in the immersive format, which features motion seats and environmental effects that bring moviegoers into the action. The previous film in the saga recorded more than 1.2 million 4DX attendees, with a $14.7 million worldwide gross at the box office, making it a top five 4DX title. This feat was greatly impacted by the remarkable success of “Furious 7” in the U.S., Europe, and Asia. “The Fate of the Furious” sped off to a great start with a remarkable opening weekend across several countries around the world. In France, it delivered an average occupancy rate reaching nearly 100 percent, virtually selling out during opening weekend and throughout the first two weeks of the film’s 4DX run. Other notable opening weekend occupancy rates for the global blockbuster include in Croatia (98 percent), Norway (89 percent), Romania (88 percent), Switzerland(86 percent), Bulgaria (83 percent) and Portugal (82 percent). The United Kingdom, Turkey and Mexico also showed high occupancy rates (more than 70 percent), and in the U.S., top opening weekend occupancy rates included 91 percent in Los Angeles, 83 percent in New York City and 74 percent in Orlando. “The Fate of the Furious” in 4DX attracted fans’ attention with an immersive cinema experience that transcends traditional theatre viewing. This includes motion-activated seats perfectly synchronized to the onscreen car chases, the use of fog during scenes on ice roads, as well as the use of snow in the auditorium for scenes set in Russia. Following the success of “Fate of the Furious,” Universal’s “The Mummy” will be premiering in 4DX this summer at 4DX locations worldwide. “The Mummy” is directed by Alex Kurtzman and stars Tom Cruise, Sofia Boutella, Annabelle Wallis, Jake Johnson, Courtney B. Vance and Russell Crowe. CJ 4DPLEX is the world’s first 4D cinema company, headquartered in Seoul with international offices in Los Angeles and Beijing. The company created 4DX, the first and leading 4D cinema technology for feature films, providing moviegoers with an immersive cinematic experience that utilizes all five senses, allowing the audience to connect with movies through motion, vibration, water, wind, snow, lightning, scents, and other special effects that enhance the visuals on-screen. CJ 4DPLEX brings 4DX auditoriums to exhibition partners along with 4DX codes for both major Hollywood blockbusters and local titles. Each auditorium incorporates motion-based seating synchronized with more than 20 different effects and optimized by a team of skilled editors, maximizing the feeling of immersion within the movie, beyond the limits of audio and video. Since 2009, more than 420 Hollywood titles have been screened in 4DX. As of May 2017, more than 46,000 4DX seats operate in 375 auditoriums spanning 48 countries. CJ 4DPLEX was named a Most Innovative Company of 2017 in Live Events by Fast Company. For more information, please visit www.cj4dplex.com. Tags: 4DX, CJ 4DPlex, "The Fate of the Furious"